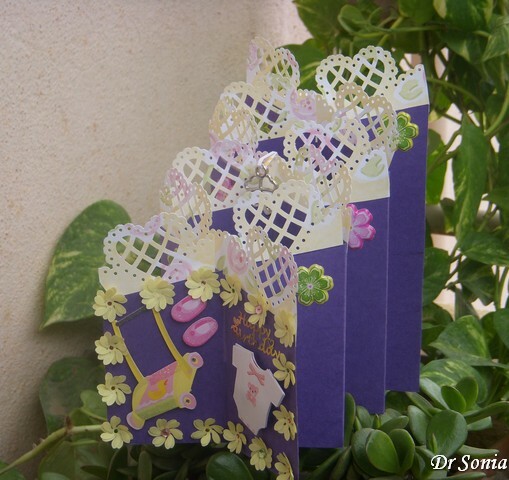 Cascading cards look so complicated but are rather easy to make! [Link to cascading card tutorial]. It is funny how we bloggers inspire each other. My blogger pal Lisa Jane shared a gorgeous cascading card which she linked to me and I love her card so much that I in turn used her MS punches idea on the layers of the cascading card. I kept the side panels simple with flower stickers in colors to match the rest of the cascade card. Dangled a clover -heart charm [for good luck!] in the center of my cascading card.I used the same gorgeous baby theme stickers [which my daughter won from Khalindi] to make a gift box. I had an absolute blast making these paper boxes. The box lid is attached to the lower part and opens in the style of a hinged box. Edited: This card came top 4 at BGC and I have been invited to Guest DT! Oh this is fabulous .. and that's what i love about blogging/crafting buddies .. we all inspire each other! I love the colours you have used .. so pretty . Did your punch work better after using it in tin foil? Thank You Lisa! Lisa the crazy punch works well on thick card stock but thin pattern paper or normal paper makes it rebel! Both projects are very pretty, elegant and ornate. Love those punched shapes! Yes I love the box too--have fallen so in love with it I am on a box making spree!! Sweet Blend, these are majestic. I love that cascading card and have never seen one before. Thanks for the tutorial link. You punching is so elegant and dainty and matches the baby theme perfect. Adorable set! Oh thats fabulous Jessica I would love to see your version! Gorgeous cascading card.Nice way to make border using punches. 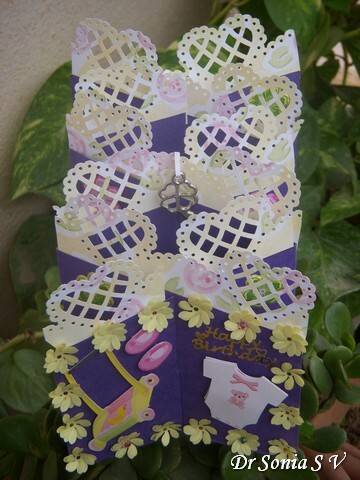 I never make different shaped cards, But seems u enjoy making such. Its inspiring. I would try making . 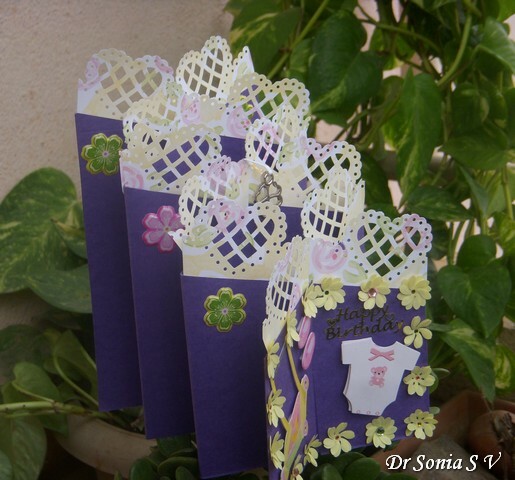 Jyoti you would do an awesome job with quilling on any shaped card!! Both creations have so beautiful colours and lace and I like them a lot ! Bhawana decorating an album is tough thats why I never have the courage to make one! Thank You Hussena I will enjoy participating in your punchcraft flowers challenge! Sonia, my friend, you truly are a gifted talent!!! This set is just amazing!!! I just love the lacy hearts and edges, and the colors blend beautifully! Love this card and box set for sure! 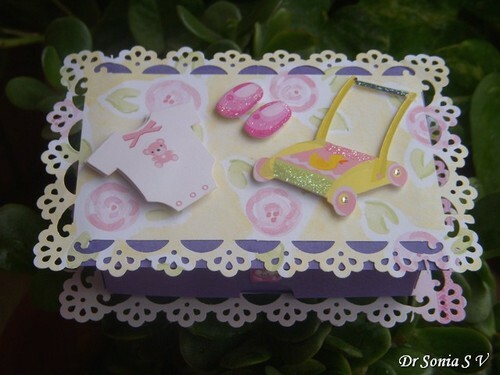 Beautiful card.love that heart border and flowers.Adorable favor box.really cute embellishments.Your little help is to cute.love the recycling of the old card to do the pram.The little doll is too cute with that beautiful pram. Very beautiful work, Sonia!!! You have a lot of pretty and original ideeas!!! Thanks for your participation to my candy and wish you good luck!!! Sonia, this is just stunning, love all the hearts on the cars and the box is beautiful, so many ideas of how to use it are swimming through my head...gorgeous. wow!!!!! !.card and box both are very pretty .i am waiting for the box tutorial . Lovely cascading card with the punched layers. Love the giftbox and look forward seeing the tutorial. Lovely cascade card with the ounched layers. The giftbox is beautiful. I look forward seeing the tutorial. It is lovely to have wonderful blog friends to cheer us on our way. Beautiful work Dr Sonia......love those hearts you have added to each layer. Thanks for sharing this in our CELEBRATIONS challenge at Unstampabelles. Wow, this is amazing, so many details. Thanks for playing at My Craft Spot. It's so pretty! I love how you utilized your punches here! Stunning! And thanks for the tutorial!! I love cascading card... the outcome is so royal.. love yours to the core.. The box is so cute.. waiting for the tutorial..
Do you sleep Sonja? Another great project. Love that cascade idea. Thanks for entering this in Unstampabelles Celebration Challenge! wow this is such a cute card Doc! I see your new collection of MS punches too! I have been wanting to try this type of card since long but it looks so complicated. What a sweet project. Just a super cascading card and box. Good way to use the punches, too. Wow Sonia, this is stunning! your work is always a delight, but this is sooooo beautiful. LOVE it. Thanks for joining in our Celebrations theme at Unstampabelles this month. Very cute project.... love the colors!!! aS usual fantastic!!!!!!! !both the card and the box...really pretty! wow there both so gorgeous,and look to be hard to make, love them !!!! Wow, such a beautiful set - love the heart clover charm and that box is just so cute ;-) Thanks for joining in our Celebrations Challenge at UnstampaBelles. 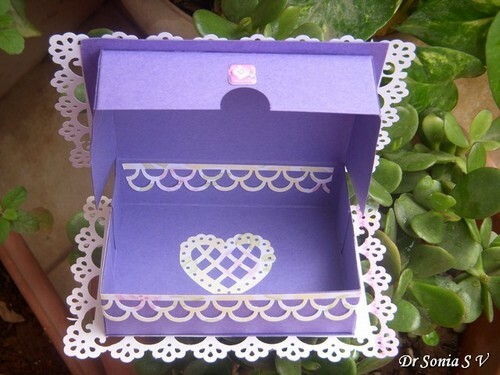 Fab idea, gorgeous card and box. I hope you are not having as many problems with your punch. Thank You Jane--I bought 4 MS punches ;other 3 are gorgeous but this one leaves jagged edges which I have to snip off with scissors! Kishley I am not too in love with this one as its a horror at times and wastes paper by not punching properly! So gorgeous! Love the matching box! How very creative and lovely too! What a keepsake for the receiver! I love your art and color. I have missed your creations!!! hahahaha!!! you are so creative it blows my mind, this is beautiful!!!!!!!!!!! I just found your Doctor blog!!!!! Of course I followed it! So nice to see you! Thank You Naomi--I dont post much nowadays on my ENT blog ...craft blog is more fun..the other one is work! Hello crafty doctor !! 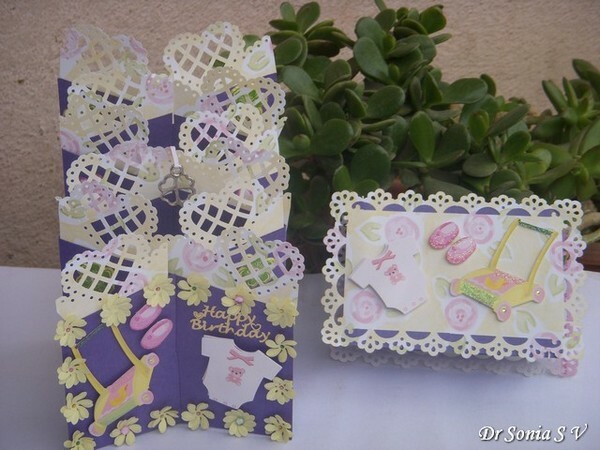 Lovely project, your cascading cards are amazing ! Geat card. I really like the look of the gift box as well. Thanks for playing at UnstampaBelles. Super beautiful set! Thanks for sharing over at Unstampabelles! This is so adorable. It always amazes me when I come here how you do all this without a a cutting machine. This is so sweet!! The punch work looks beatiful and the box is PERFECT! I'm sure a new Mom is going to love it! I hope you and your little assistant are doind well! Thanks for joining us at My Craft Spot! Hi Sonia, this is awesome, plain awesome... love the MS punch and what you did with it. This is an adorable card! I love the soft colors and hearts popping out of your card. What a darling gift set! GREAT design!!! Thank you for joining us at Fashionista Challenge this time!We appreciate your entry and wish you luck and success!!! 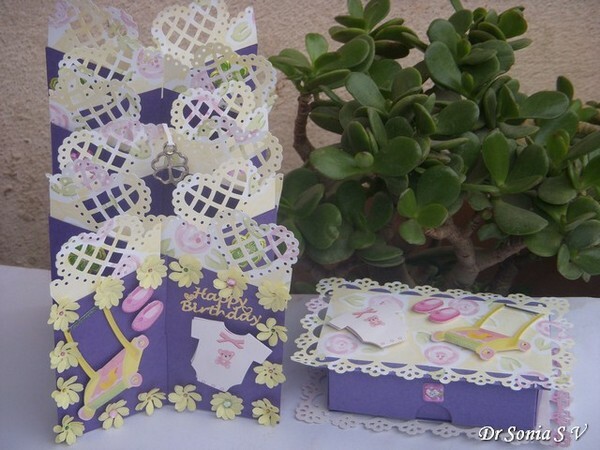 What an amazing card and box, Sonia! Wow! I especially like the heart lattice cuts that you've used. They are so pretty! That is a wonderful card! Stunning gift set. I love the box. All the details make it perfect. You always amaze me with the beauty of your crafts. Wow! Just Wow! Everything about your projects are just Beautiful. As a nurse i know how hard it is to make time for relaxing and I love to use stamping and papercrafting for my relaxation too. Am adding you to my feed so I can see more of your beautiful work. Would love it if you get a chance to stop by my little corner of the world some time.